A few weeks ago we reported on the Splatoon 2 European Championship, so now that it's all done and dusted... we thought we'd give you an update and let you know who the best players of Splatoon 2 in Europe are. The amazing Team Gucci Gang managed to beat El Firmament in the gripping finals of the epic championship. After almost a year of splatting at the highest level all across Europe, Splatoon 2 national champions and top-ranked teams came together for the Splatoon European Championship’s grand finale in Switzerland this past weekend. After two days of thrilling matches at the Polymanga event, it was German team, Gucci Gang who came out on top with a 2-0 victory against El Firmament in the final. Not only did team Gucci Gang all leave with a special jersey – on top of earning the title of Splatoon European Champions and the gleaming trophy that comes with it – they will now represent Europe on the biggest stage of all, at the Splatoon 2 World Championship from 11th – 12th June in Los Angeles. They’ll be up against the top teams from the U.S. and Canada, Australia and New Zealand, and Japan – can they emerge victorious on the world stage? To see how team Gucci Gang secured their ticket to Los Angeles, you can watch the enthralling Splatoon European Championship final on the official Nintendo YouTube channel. Although both teams managed to impress throughout the tournament, it was team Gucci Gang that stole the show with a 2-0 victory against El Firmament in the final that ended with an impressive display in Splat Zones. Prior to the closing stages of the tournament, fans got to witness a special virtual concert where Pearl and Marina, of the game’s pop idol-duo Off the Hook, appeared onstage and sang along to a series of tracks and performed their slickest choreographed moves, all accompanied by a live band. Stay tuned to Nintendo social media channels to follow team Gucci Gang’s preparations for the Splatoon 2 World Championships, and more details about the Los Angeles event will be announced in the future. Team Gucci Gang were crowned Splatoon European Champions in Switzerland on Saturday, and viewers can relive the excitement by watching the final on YouTube. 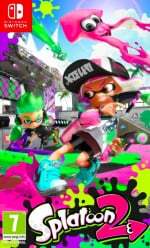 Team Gucci Gang will now have its eyes on an even bigger prize as it prepares to compete at the Splatoon 2 World Championship which takes place from 11th – 12th June in Los Angeles. And to round off the weekend’s Splatoon 2 happenings, Pearl and Marina, of the game’s pop idol-duo Off the Hook, performed a special virtual concert for fans prior to the closing stages of the tournament. Annoyed by the choice of the Polymanga organizers to have a purely french introduction to the whole event. "European championships" should be a little bit less french. I work with French people that frequently excuse themselves for other Frenchmens arrogance, but one would think that an event in (the French part of) Switzerland hosting European Splatoon Championships would know better. They should call themselves pain killer, way better song. RIP that one team named Splat Tim. Turns out, they couldn't do it.